Most players are familar with the requirement in Article 16(c) always to carry a boule towel in order to be able to remove (enlever) any mud or foreign substance clinging to a boule before throwing it. The rules, however, do not contain precise specifications for boule towels, so it is hardly surprising that the most frequently-asked questions about the rules of petanque are questions about the boule towel— What kind of fabric should it be made of? How big should it be? How should it be held and used? Perhaps the most surprising thing about boule towels is that the usual English translation of the French word (chiffon) is “boule towel“. In fact, toweling material, thick and fuzzy, is completely unsuitable for use as a boule towel. It quickly picks up stray bits of leaves, twigs, and thorns and is almost impossible to clean. Instead, we recommend a fabric with a much smoother, harder texture— a patch cut from the leg of a worn-out pair of jeans does the job nicely. There is no regulation size for a boule towel. A towel that is too small to do the job is obviously undesirable; a towel that is too large will be clumsy to use and carry. 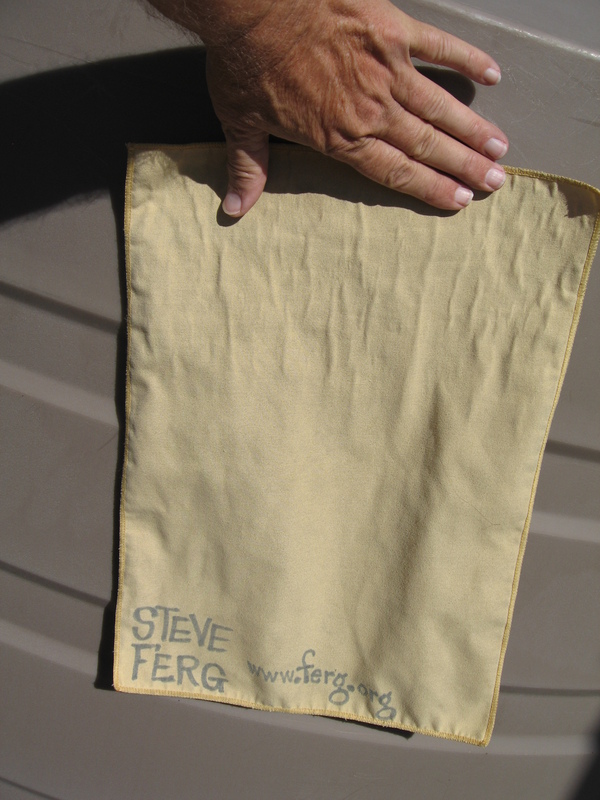 We have found that a rectangle of fabric approximately 29cm x 43cm (11.5″ x 17”) works well. A cloth table mat makes an excellent boule towel. Some so-called “experts” advise a player with a larger (or smaller) hand to use a larger (or smaller) towel. That’s rubbish, of course, since the relevant factor here is not the size of the hand but the size of the boule. A player who uses a larger (or smaller) size of boule should use a larger (or smaller) towel. Finally, there is the question of how to carry and use the boule towel. Here, there are two basic requirements: one legal, the other practical. The boule towel must NOT be carried in such a way that it hides any boules that the player might also be carrying in the same hand. And, as a practical matter, the towel must be carried in a way that it can be conveniently used when needed, while not interfering with a player’s grip on any boule(s) that he may want to carry in the same hand. 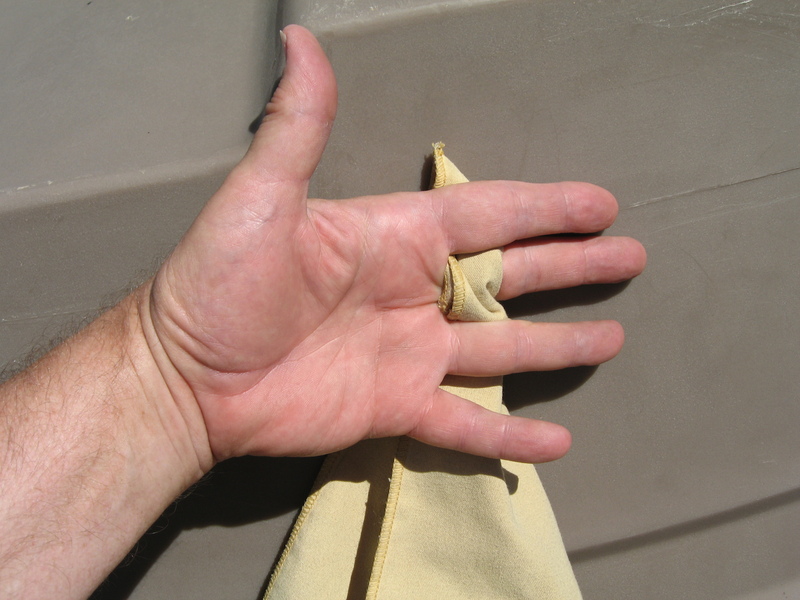 The pinched end of the towel is then threaded through the fingers in the manner shown in the photograph (below). When the hand is closed and holding a boule, the fingers naturally and effortlessly grip the towel firmly, and the tail of the towel falls cleanly away from the hand. 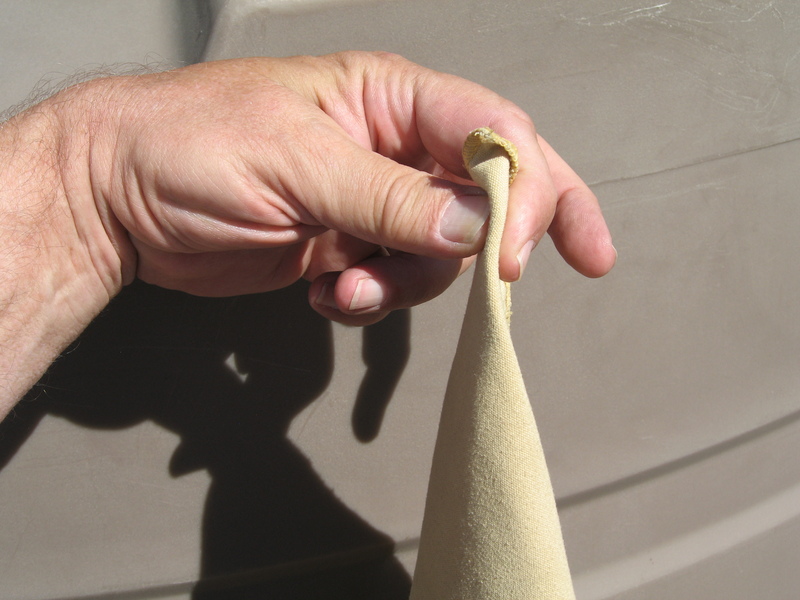 When the towel is needed, the long loose tail can easily be folded up and over a boule in the hand in order to wipe the boule thoroughly. While doing this, it is easy to clean and dry the fingers and palm of the throwing hand by rubbing them vigorously with the cloth-covered boule. 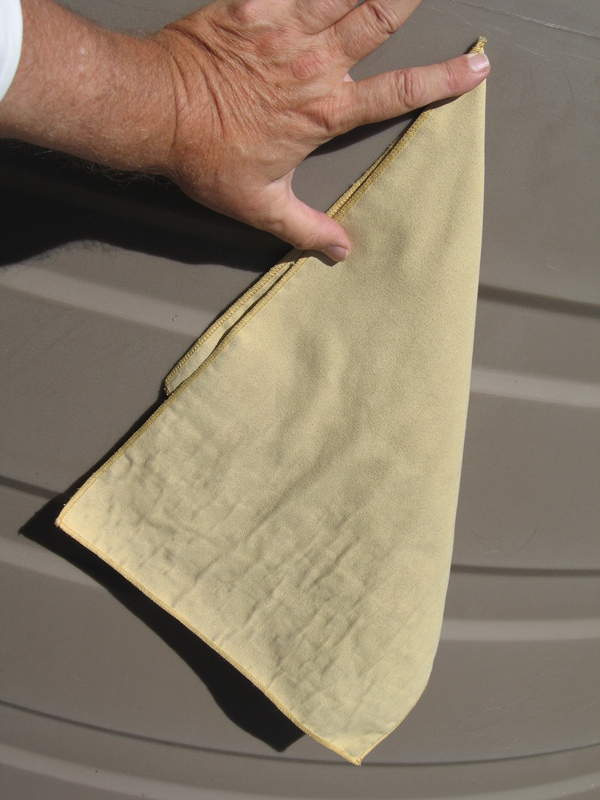 Once you have found a boule towel that perfectly fits your hand and your playing style, you should treat it like what it is— a piece of personal hygiene equipment. Never lend your boule towel to another player; you don’t want to catch their cooties. NOTE I am not a certified umpire. The opinions expressed in this post are solely my own and do not represent official rulings or rules interpretations of any organized petanque federation, national or otherwise. Posted April 1, 2017. Good god! Can we all please just loosen up a little bit? Hi Art— I certainly agree that it is foolish to read more into the rules than is really there. But, still, I think you can learn a lot by reading this post carefully. It would also help, I think, to look up and read the exact wording of Article 16(c), and also to do a “mouse hover” over the date at the end of the post. I use a microfibre cleaning cloth for wiping my boules. It is 30cm by 40cm. I have it hanging from a back pocket or from the rear waistband of my shorts. Using your own cloth is better than using your opponent’s shirt when removing foreign material and moisture from boules. Our copy of the english translation of the latest international rules does not break Articles into sections a,b,c etc. Which rules are you referring to Jules? Hi kimbo, You’re right. I should have provided a link to a copy of the rules that shows that formatting. For a bit more information, do a “mouse hover” over the date at the end of the post. gday Jules, I am on an iPad so I don’t have a mouse, I tried using the dog, I even tried using my finger but the hovering over the date thing does not reveal a link. Are you referring to USA rules? Keep in mind that your followers here are possibly using different sets of national rules or as we do simply refer to the international rules. Hi kimbo — Well, I guess it is time to quit being coy, and just come right out with it. I think you need a new set of fingers. What is SUPPOSED to happen when you hover your cursor over that date, is that a small message should pop up. The message is “April Fool!”. There are a number of clues in the post that something is fishy, but the smoking gun (beside the date of the post) is that there is no such thing as subsection (c) of Article 16. So – Happy April Fools Day to you. You DO have April Fools Day in Australia, right? Jules April 1st prank, what a beauty! Yes indeed we have April Fools here. Hmm looks like I will have to make up for the time difference, LOL, still chuckling here. You realise there was a side benefit in that it alerted me to the update in rules.